Quikbook is a company that's been around a long time, dating back nearly 20 years when the company started as a call center operation, booking discount hotel rooms. They joined the online ranks in the late 90s, and desperately needed a facelift to their existing site. 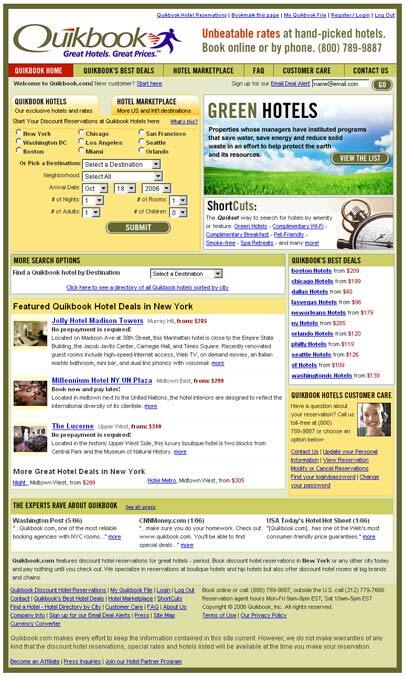 The site overhaul, including various search engine optimizations, began in April 2006 and was completed in August 2006. I championed the entire effort, from personally creating wireframe mockups to designing the final templates, implementing search engine optimizations site-wide, and overseeing and contributing on final production.